Well, the inevitable happened – after yesterday outlining the changes to points caps and earn rates on the Citi Signature Visa, I thought cardholders had gotten away with avoiding further devaluations to the Signature and Prestige Visas. 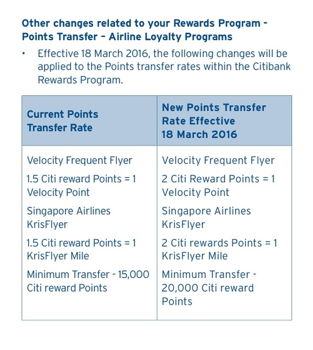 Unfortunately, I was wrong – and Citi’s previously flagged reduction in transfer rates from 1.5 Citi Rewards points = 1 Velocity point or 1 KrisFlyer mile to 2 Citi Rewards points = 1 airline point, is coming through. This time though, they are giving at least 90 days notice, with the changes pegged to come through on March 18th. The key changes are self evident – the reduction in transfer rate and increase in minimum points transfers. Transfer those points over by mid March! 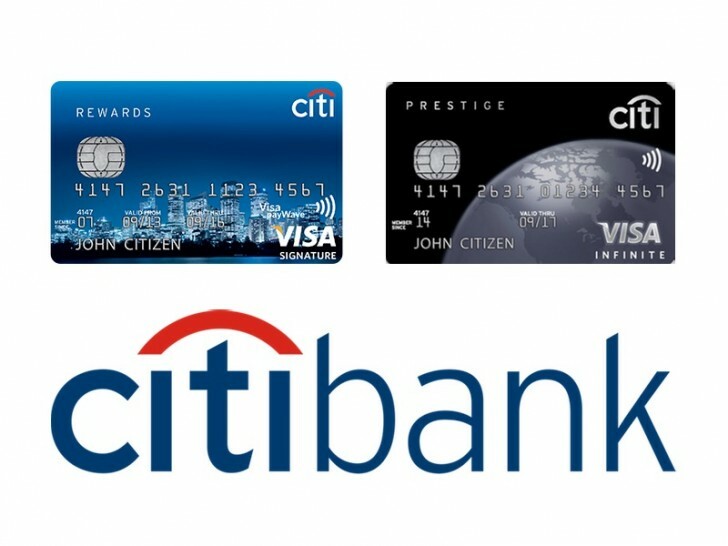 In a positive turnaround, Citi have reversed their decision to cut the points transfer rates from Citi Rewards to Velocity and KrisFlyer, which saw Citi cardholders face a loss in points value of around 25%. AusBT are reporting, and Citi are confirming via Facebook comments, that the new rates will be reversed in coming days – so don’t transfer your points out of Citibank in the short term until that’s been fixed. This is actually fairly amazing. Behind the scenes at Point Hacks I’ve heard of several members out of pocket for the equivalent to the tune of millions of points, and also witnessed a powerful movement of many of them banding together to put an immense amount of formal pressure on Citibank to resolve this in their favour. The fact that their efforts, and everyone else who pressured Citibank through public channels – the AFF forum, Facebook members, AusBT and your comments here – shows that banks need to think through any changes they make to rewards programs, and make them within the scope of their terms. 3.6.4. We may change the Points Transfer program rules including participation of travel loyalty program providers, regulations, policies, benefits, conditions of participation or points/mileage levels (if applicable), in whole or in part at any time with or without notice. How confident that leaves us about whether they would actually do this in future, I don’t know. 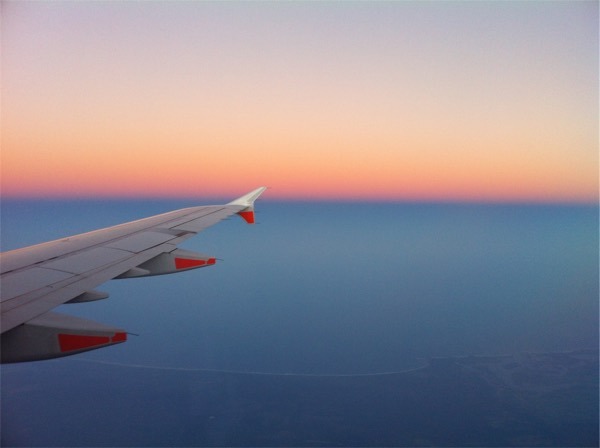 The best tactic is probably to keep on top of your points balances, ensuring you transfer them out strategically to airline partners on a regular basis. Regardless, it’s clear they will face an immense consumer backlash from an extremely passionate community if they do something similar in the future. Well done to those who put the effort in to push Citi on this one. I’ll let you know once the transfer rates have been updated in Citi’s systems. The Citi Rewards program has long been a favourite of points collectors looking for an alternative rewards program that’s not linked to an American Express. The transfer rates from Citi Rewards were just cut – down from 1 Citi Reward to 0.666 KrisFlyer or Velocity miles, to 1 Citi Reward to 0.5 airline miles. This is for both the $700 pa Citi Prestige VIsa and the Citi Signature – almost a 25% cut in value. What’s worse is that this was done on November 1st, and existing cardholders were given no notice. This, to be honest, is a pretty appalling way to run a rewards program. I’ve summarised the differences in the previous transfer and therefore earn rates for the two key cards and the new below. It’s not a pretty sight for either set of cardholders. The Citi Prestige Visa has a $700 annual fee, so for this to go to a 1 point per $ earn card for two of the major airline currencies on the market, when there are higher earning cards out there, is not good. For Citi Signature cardholders this means that their effective earn rates on spend have been cut from a relatively market leading position. Any changes made are always in line with the rewards terms and conditions. We believe our rewards program continues to provide excellent value for our customers. We continually review our rewards program to ensure it provides value for all of our customers. We have recently conducted one of these reviews in light of recent external market changes and the impacts on our Rewards Program. Firstly, if you are interested in whether this is above board, the Citi Rewards terms are here. * If we change the Point value of individual goods or services in the program to reflect changes in the price charged by our suppliers for those goods or services, or if a particular Reward is unavailable we will notify you on our rewards website at the time you redeem your Reward. I don’t know if Citi are within the terms of their program to make a change with no notice if they claim that the price charged by KrisFlyer or Velocity has increased. I don’t believe that a points transfer is a ‘good or service’, but wouldn’t be surprised if that term is leant on to disclaim the lack of notice. I am no lawyer, so if you have a specific reading of the terms, I’d love to hear it in the comments. So, firstly, contact Citi and express your displeasure. Ask for discounts on your annual fee and/or bonus points as compensation. If you don’t get a satisfactory outcome, maybe it could be worth asking the Financial Ombudsman to get involved. If you are willing to share any successes, again, please do so in the comments. How it should have been done? I don’t think making changes to a rewards program is a problem. Businesses and contexts change all the time, and as consumers we need to be prepared for that. However banks and rewards programs need to recognise that member engagement is only possible if there is consumer trust in the program. Trust needs to be engendered by providing clear notice of changes, in writing, allowing the consumer to take action based on the change. Regardless of Citi being in the right or wrong according to the letter of their terms, they will have screwed many consumers by reducing the value of their hard-earned points balances, without offering the ability to do anything about it. What are the non-Citi Visa options for Velocity earn? For heavy non Amex users, this leaves few Velocity-linked cards that earn 1 point per $. The Virgin Money Visas lead the pack at 1 Velocity points per $ on the Flyer Visa, and 1.25 points per $ on the High Flyer Visa. The Virgin Money cards are also issued by Citibank – but are managed by an independent business to Citi. My understanding that points earn rates, bonuses and other key product features are managed by Virgin Money, not Citibank, but I suppose there’s also a small risk of product changes there. I’ll also change the Point Hacks card guides to Citi Rewards, and the Citi Signature and Citi Prestige Visas in the next day – unfortunately I’m travelling most of today but will try and get this done ASAP. Finally, I’ve also tried to confirm with Virgin Money that the Flyer Visas remain unaffected for the foreseeable future. Again, I’ll add any comment I can on that to this post. Thanks to a Point Hacks commenter for the heads up, and AFF for links to terms and their opinions. Has anyone received their promised points yet? Presumably the revised terms and conditions (allowing Citibank to change transfer rates without notice) will only come into effect 30 days after they have given cardholders notice of the change (as required by dot point 2 in clause 6.2). In my haste to be done with Citi I moved all my current points from them at the lower rate so that I could ring today and cancel the card entirely. Now that they are doing the reversal I was curious as to what would happen to the points I didn’t get because I transferred at the wrong time. Apparently they will be credited to Krisflyer this Sat as if I had done the transfer at the .667 rate. According to the Citi rep many people have called regarding this and it was organized as part of the overall reversal. So rest assured if you happened to transfer points this last week (accidently or deliberately) then you will receive a top up on Sat. Not sure what would happen if you are one of the people that got a top-up after complaining and then transferred. Good news about the reversal, pity such pressure has been ignored by Qantas on their sneaky short-notice (30 days rather than the 90 days that really should have applied) change to status credit earn on OneWorld airlines (clearly designed to effect long standing Xmas holiday bookings). Regarding FOS – the Financial Ombudsman Service – it’s important to note this is not an independent umpire by any means but an industry funded pet that is a strategic defence against a real independent body limiting the finance industry cowboys. While small financial entities (who pay little to FOS) may be checked in bad conduct, the large financial entities (the big banks and insurance arms, etc) hold huge sway and really own the FOS (if they are unhappy with any FOS action, you can be assured it’ll quickly be undone by hook or by crook). FOS sat on it’s hands, for example, for the majority of the recent financial services scandals – only taking token action after the Commonwealth Government agencies had already intervened. It’s nothing more than a paper tiger, creating the illusion of some consumer protection in what is still a wild west industry. Some industry ombudsman entities have a reasonably decent track record (TIO is pretty fair), but FOS has a very bad track record and dirty hands. As such, you can be assured appeals to FOS with regards to poor actions that Citibank previously took in this matter would have had zero effect. This change by Citibank was all about the negative publicity created, which Citibank was aware would hurt new credit card applications and other new business (and it’s ability to generate profit) – that’s why it worked. Thanks for the insights. I’m not across the history of FoS and their capabilities, interesting to hear your take. From what i heard, Citibank will revert the new changes back on Monday. So i guess anyone who wants to transfer points should do it after Monday. Thanks Pointhacks for doing all the research and putting up the post. Keith, on of the points in 6.2 of their terms and conditions is that they will give 30 days notice of any change their Terms and Conditions, so changing them without that notice is itself a breach and worthy of complaint. Hopefully this will got to the ACCC because this is just amateur comedy hour from Vitibank and regulatory oversight would slow them down! Hi Ilya. Did Citibank reverse their decision and did you receive your points? I have just tried to redeem my points but they are still only offering 50% for Krisflyer. To be a man of my word, I promise Citi I would share this – so here it is from last night. As a loyal customer I was disgusted to find out that the transfer rate from Citi Rewards to both Krisflyer and Velocity has been devalued. I have a Signature and a Prestige card and my wife has a Signature card (was about to apply for a Prestige card until this morning). Last week we had a combined number of points that would convert to 554,230 Krisflyer miles and this week you have taken from us 138,558 Krisflyer miles – with absolutely no warning. We were about to convert to Krisflyer for award First Suite tickets. Citibank has violated my trust. There are 3 courses of possible action here. Reverse this decision, give clients appropriate notice and allow them to display loyalty, or leave. It would appear that you are willing to lose many clients, since you have clearly thought through this prior to making the change. You will see from your records we put a lot of money through your accounts and are particularly aggrieved at this very poor client treatment. I called your Prestige line this morning and voiced my displeasure and annoyance and specifically requested that my contact records reflect the conversation and that the Client Service Manager call me personally. I very much doubt that there is such a level of care. Maybe as an apology from Citibank, they might be a late participant in the 15% bonus Velocity transfer. Who knows? As soon as the reversal hits their systems I’d be getting points out at the better rate. No doubt the plan will be to return to the lower earn rate, they’ll just give more warning as per the T&C’s. Hope I’m wrong, and I applaud Citibank for responding in this way and accepting they managed it poorly, but still. Now if only they were in the current 15% velocity bonus for transfers! Citibank called me today. They are reversing the cut and say this will be reflected on the website by Saturday morning. Power of the people worked I guess!! I had a conversation this morning with client services and have written a letter to which i will probably not get the courtesy of a reply. the devaluation on conversion just cost me 140,000 Krisflyer miles – was waiting for sufficient for 2 * Suites tickets to Europe. Not as severe as GHK, however will pay up balances on our 3 cards and take our 250k pa spend to another bank. REALLY hacked off! This is like the AMEX fiasco 7 years ago 5000 point per 10 transactions. Until the points actually arrive in your account I wouldn’t open the champaign. I was offered a full refund of annual fee, but was halved without any notice. Afterwards just got a phone call from the agent saying the request was declined and $350 was refunded already without my consent. I have a lot more points than you and I hold a prestige and I’m a high spender. Even that they treat me this way, I wouldn’t put too much faith on the 30k points. The signature has an annual fee of $300 which is higher than most visa/MC cards. Hardly an incentive to sign up when you’re paying more for a lower earning rate. What’s frustrating for me is the fact that every purchase I make these days needs to calculate the merchant fees I’m being charged and if it’s worth using my card or not . This Citibank fiasco not only has cost me a ton of points but has cost me more $ per point . Now from what I can take from that, the “industry wide change” is the most concerning. I’d like to see if other programs follow suit. Might as well cash in on that 15% Velocity redemption before ANZ follows? Thanks Glenn. Maybe that’s referring to recent thinking around interchange/merchant fees which I believe might see them decreased or capped. I can’t find a useful link quickly though. That’s certainly not something that the average consumer would know about, although it would technically be “public knowledge”. Yes, that’s what I thought as well. I guess we’ll be kept on our toes in the coming weeks to see what evolves out of all this! I’m a lowly platinum holder (fee free for life though) – am I affected by this? I believe so, yes. It’s the same rewards program used across all Citi Rewards programs with different earn (rather than transfer) rates on each card. As a result the transfer rate changes I assume are the same across the board. Regarding comments regarding FOS, FOS deal with complaints both large and small and have previously got involved in disputes about banks changing fee programs without notice, as have ACCC I believe. Yes, regardless of size of complaint you are required to try internal dispute resolution pathways first but indications are Citibank seem prepared to ignore their own T&C’s and hence FOS may be the only viable way to get what you are owed. the Financial ombudsman is a last resort, you’d have to demonstrate you exhausted all dispute resolution with them. I’m not saying people are not impacted, but if as someone has already said Citibank are giving some points back in compensation or waiving annual fees in response, that would be interpreted as some part in resolving the dispute. I have just lost 50k krisflyer points just because of this change and only found out after I read your blog! Extremely disappointed as my husband and I have been planning to transfer my points for our travel next year. I called Citi today and was offered 5000 Citi points (equates to a sad 2500 kf points) for goodwill gesture. No resolution is offered today as they are saying the changes were initiated from the airline side and they haven’t been given notice by the airline about the change either. They have escalated this with the relevant group is all they say. I am not going to accept this as if they put this on their rewards terms and condition, there should have been a prior notice to all existing customers. There must have been a broken communication or update process between Citi and airline, otherwise Citi would be breaching it’s rewards T&C everytime there is a change. Anyway, I am calling AGAIN in 2 weeks for a resolution. So glad I didn’t apply for Prestige. $700 pa for 1 point per dollar and no ATO? Tell em the’re dreaming son! Citibank have also cut the transfer rates for their CitiBusiness card as well. Qantas transfers are now 1citi=0.5qff cutting the value in half. Also reduced SQ & Velocity transfer rates. That’s for the old Citi Business Gold card, right? Wow. This is BS. Was looking to transfer my points over, but this is pathetic by citi. They aren’t offering anything on the phone either. Useless. Any changes to Qantas points earning? Hey Joan – no, not at this point thankfully. Not happy about this change. Redirected some direct debits to Amex Platinum Edge now as it’s still 1MR to 1 VA/KF. Only reason why I directed to Citi in the first place was to hit minimum transfer 15k quickly since I’m not a high spender and it was 1.5 Citi to 1 VA and I only transfer during the bonus VA promotion. Argghh, that’s rather annoying just as I was about to transfer a bucket load of points to KrisFlyer. Let’s see if they can do anything even if I am on the no-annual fee package. Disgusting! Citibank would have known that many of their customer base would have been accumulating points to transfer to Velocity or Krisflyer. People would have been making plans for overseas trips based on those points only to find out those points are worth 25% less than they were on October 31. I’ve just lost 40000 Krisflyer points. To make this change without any notice to their customer base appears very underhanded. I have spoken to the Customer Contact Centre in relation to the terms and conditions. After initially saying that Clause 6.2 only related to products bought out of ‘the Citibank Catalogue”, the operator then claimed that changing the points redemption value was permitted under the final point of Clause 6.2 “If we change the Point value of individual goods or services in the program to reflect changes in the price charged by our suppliers for those goods or services, or if a particular Reward is unavailable we will notify you on our rewards website at the time you redeem your Reward”. I used to tell everyone about how good the Citibank Signature Card was. Now I’m just P’d off with them. A quick call to citi and they credited my account 7500 to compensate. Better than nothing. Thanks for the heads up. So annoyed about this just moved to this card from the Virgin High Flyer. Luckily I’ve been moving points regularly. I’ll be calling and asking for a discount/refund on the annual card fee.! whilst the changes are not welcome. It’s a fair comment. Anyone substantially out of pocket definitely needs to work with Citi on resolutions first. I have heard from people who have lost several hundreds of thousands of points value as a result of the changes, so noting this as an option, not necessarily endorsing it. No it’s not really a fair comment – because you could then say something similar about calling the fire brigade because you have a snake in your house vs someone who actually has a fire. You call the relevant authorities for anything ranging from one extreme to the other, so just because they have better things to worry about doesn’t mean you can’t/shouldn’t complain. Having said that, I agree that it’s a little extreme to call the Financial Ombudsman, but on the other hand, I do think companies need to stick to their T&Cs and if they say they will give 90 days notice and don’t, then they need to be held accountable to that. Sorry – to add to my comment, maybe a better example would be filing a police report for having your mobile phone stolen, as opposed to someone who is reporting a murder. You don’t see the cops telling you to go away for reporting your phone as being stolen, despite the severity of other issues that are facing them. Keith – could you add an edit comment function? I’ll look into an edit comment option, yep.